The increased risk of liver cirrhosis, liver-related morbidities and mortalities has been attributed to the excessive accumulation of myofibroblasts in injured liver cells (a.k.a. progressive liver fibrosis). Liver injury triggers the trans-differentiation of quiescent Hepatic Stellate Cells (HSCs) into proliferative, migratory and fibrogenic myofibroblasts and induces the accumulation of factors that trigger the activation of the hedgehog pathway. The accumulation, growth, and maintenance of myofibroblastic HSCs in injured liver cells are promoted by hedgehog signaling and the activation of Yes-associated protein 1 (YAP) in these cells. Myofibroblastic HSCs share similar bioenergetics and biosynthetic requirements with cancer cells. Hence, some studies have suggested that glutaminolysis is a major component of the metabolic reprogramming that is required for the growth of cancer cells. Even though previous studies have indicated that the hedgehog pathway regulates the activity of YAP in HSCs and increases aerobic glycolysis during HSC transdifferentiation and adipocyte differentiation, an increase in aerobic glycolysis alone may not be enough to meet the bioenergetics and biosynthetic demands of myofibroblastic HSCs. 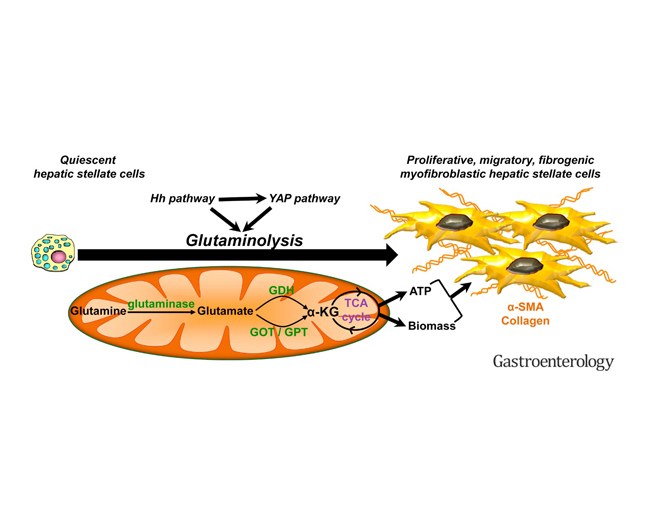 Recent studies have indicated that glutaminolysis plays a critical role in the regulatory functions of hedgehog-YAP in metabolic programming and fate-driven metabolic reprogramming in injured liver cells. Although some researchers have indicated that the induction of glutaminolysis is a major component of the metabolic reprogramming required for the excessive accumulation of myofibroblasts in lung fibrosis, there is a paucity of information on the major role of glutaminolysis in the transdifferentiation and growth of HSCs. Recently Duke University researchers: Dr. Kuo Du, Dr. Jeongeun Hyun, Dr. Richard T. Premont, Dr. Steve S. Choi, Dr. Gregory A. Michelotti, Dr. Marzena Swiderska-Syn, Dr. George D. Dalton and led by Professor Anna Mae Diehl from the Department of Medicine and in collaboration with Dr. Eric Thelen and Dr. Bahar Salimian Rizi from Agilent Technologies and also Dr. Youngmi Jung at Pusan National University demonstrated that the increased bioenergetics and biosynthetic demands of activated stellate cells require an increase in glutaminolysis. They also reported an increase in glutaminase 1 during stellate activation in cell culture. The research work is published in the peer-reviewed journal, Gastroenterology. The research team observed that the inhibition of glutaminolysis reduced the accumulation of myofibroblastic HSCs and suppressed the activation of HSCs. Moreover, the deprivation of glutamine inhibited the growth of myofibroblastic HSC, increased fat accumulation and the activation of peroxisome proliferator-activated receptor gamma and decreased the expression of Col1α1 in the rat myofibroblastic HSC line. Furthermore, the deprivation of glutamine reduced the migration of myofibroblastic HSCs and expression of genes that encode the matrix remodeling enzymes Mmp2 and Timp-1. In addition, the authors observed that myofibroblastic HSCs require glutaminolysis to retain a proliferative myofibroblastic phenotype while the deprivation of glutamine significantly decreased basal respiration, maximal respiration, ATP production, and spare respiratory capacity in injured liver cells. Hedgehog signaling directs the increase in glutaminolysis and activates YAP to regulate the expression of genes that increase glutaminolysis in myofibroblastic HSCs. Contrastingly, the inhibition of the hedgehog pathway and YAP activity decreased the expression of genes that increase glutaminolysis in myofibroblastic HSCs, reduced mitochondrial respiration, and growth of myofibroblastic HSCs. More importantly, they also demonstrated that in livers of fibrotic patients and of mice with acute or chronic fibrosis, glutaminolysis was induced in myofibroblastic HSCs, and inhibition of glutaminase blocked accumulation of myofibroblasts and fibrosis in mice with liver fibrosis. This indicates that glutaminolysis might be a therapeutic target for cirrhosis. Professor Anna Mae Diehl and her research team provided compelling evidence that glutaminolysis activates and controls the accumulation of myofibroblastic HSCs in injured liver cells and hedgehog-mediated YAP activation directs the transdifferentiation of quiescent HSCs and proliferation of myofibroblastic HSC via the stimulation of glutaminolysis. These novel findings will advance further studies on the effective inhibition of glutaminolysis to reduce fibrosis in patients with chronic liver injury. Dr. Kuo Du received his Ph.D. degree from the University of Kansas Medical Center. Under the guidance of Dr. Hartmut Jaeschke (leading expert in liver injury and inflammation), he studied acetaminophen (APAP) hepatotoxicity and regeneration, and his PhD thesis work demonstrated that mitochondrial oxidant stress and dysfunction play a critical role in APAP hepatotoxicity, while mitochondrial biogenesis is essential for the subsequent liver regeneration and liver repair. Impressed by the great success of Dr. Anna Mae Diehl’s (leading expert in pathogenesis of alcoholic and nonalcoholic steatohepatitis) research on liver regeneration and repair, he joined her lab in March, 2017, and have been working there to unravel the role of cell metabolism, especially glutaminolysis, in liver regeneration/repair. Dr. Anna Mae Diehl is the Florence McAlister Professor of Medicine; Director of Duke Liver Center; professor in pharmacology and cancer cell biology; professor in molecular genetics and microbiology in Duke University School of Medicine. She is a pioneer and international leader in the field of liver pathophysiology. She has conducted seminal research in many areas, including liver regeneration, non-alcoholic steatohepatitis (NASH), cirrhosis, and liver cancer. In addition, she has conducted the definitive work in understanding the important role of Hedgehog signaling in liver pathobiology.